Join Sabina and Cat for a five-day (four nights) yoga, meditation, and walking retreat to celebrate the summer solstice. The summer solstice marks the official start of summer. It brings the longest day and shortest night of the year for the 88 percent of Earth’s people who live in the Northern Hemisphere. People around the world observe the change of seasons with bonfires and festivals and celebrations and Dru Yoga! Imagine doing your sun salutations on the side of a mountain as the sun sets with a small group of like-minded yogis. 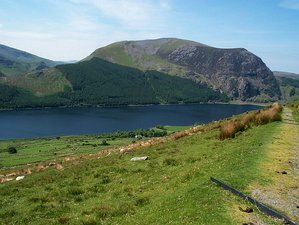 If you’re in need of a rejuvenating break then take a few days away to walk through some of the world’s most beautiful scenery - the landscape of North Wales. This yoga holiday will include mornings and evenings of Dru Yoga and Dru Meditation, afternoon guided walks in the beautiful mountains and landscape of Snowdonia National Park with stunning views across to Anglesey and the Irish Sea or along the coastal paths of North Wales. Delicious organic, home-cooked vegan meals. The yoga and meditation sessions will be taught by Cat and Sabina and will include fun activations, energy block releases, flowing sequences, pranayama, deep relaxations, prana Kriyas, and spiritual guidance. Originally from Wales but settled in London for many years and completed all studies in London. Now relocated back to Gwynedd, North Wales. Cat has been practicing Yoga since the early Nineties and has trained in many forms of Yoga, specializing in DRU Yoga. Cat trained initially with the British Wheel of Yoga before discovering DRU. She trained with the school of DRU Yoga for 3 years, DRU Meditation for 2 years and DRU Kids & Teens in London, The Midlands & North Wales. Cat feels privileged to have trained with the wonderful Yoga professionals at DRU and continuing on a path to learn.